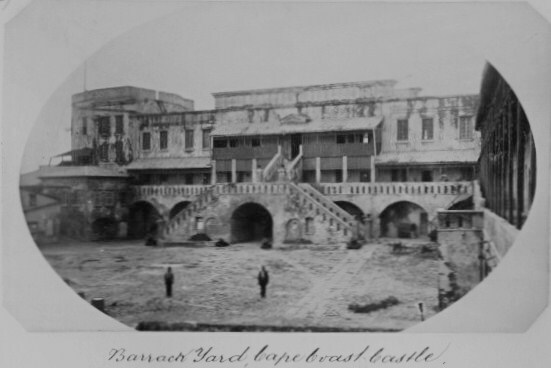 The Cape Coast Castle is one of the 30 slave forts of Ghana. 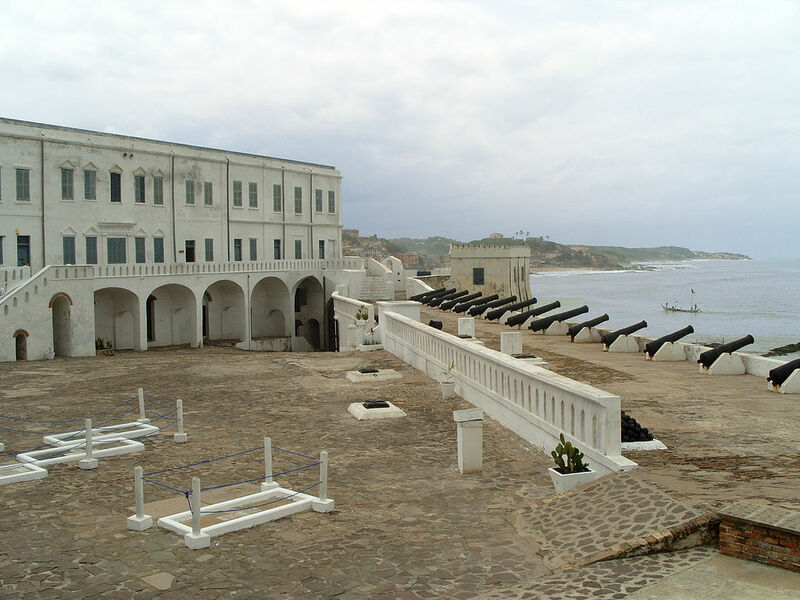 In 2009, the US president Barack Obama and his family, made a point to visit the Cape Coast Castle. So why should you learn about it? 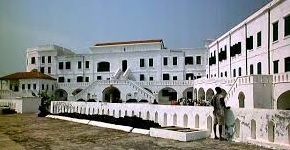 Well, it took 50 years to build the three-story building that forms today’s Cape Coast Castle. It was originally built by the Swedes (the Swedish Africa Company), starting in 1653 (it was then known as Fort Carlsborg or Carolusborg) for timber and mineral exportation, and then taken over by the Dutch before the British wrestled it away. The original cannons, cannon balls, and mortars used to defend the fort can still be seen today, facing the Atlantic Ocean. The brick courtyard of the castle, which Ghanaians commonly refer to as Cape Coast Dungeon, has two 18-foot water wells and four graves. The first grave is for the Rev. Phillip Quarcoo, the first black Anglican pastor in the area. Beside him lies C.B. Whitehead, 38-year old British soldier who was killed by a Dutch soldier in the courtyard. Besides them are the graves of Letitia Elizabeth Landon, and her husband George MacLean, the British governor of Cape Coast from 1830 to 1844. I am not sure how a woman could possibly live next to such atrocities; maybe by rationalizing that the people being imprisoned, were not human beings? The open auditorium on the top floor of the former administration building now hosts an exhibit chronicling the history of slavery on Ghanaian shores. 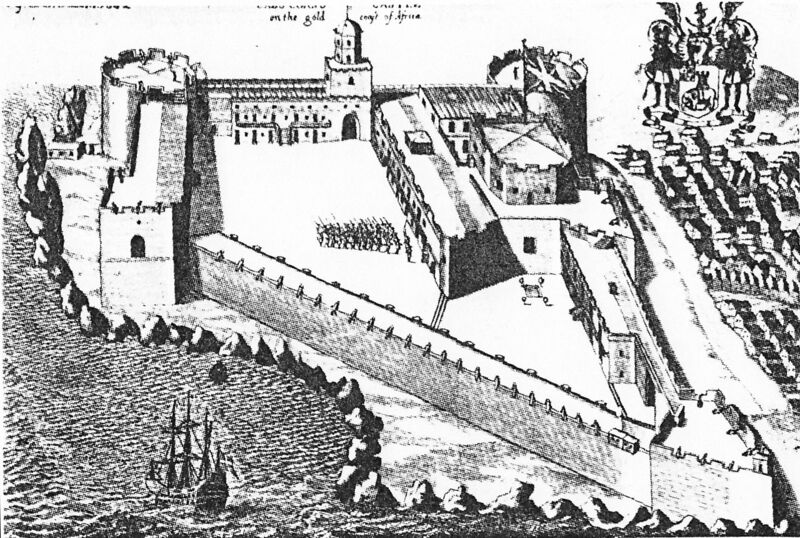 During the 17th and 18th centuries, the Cape Coast slave fort imprisoned about 1000 men and 300 women for any given 3 months period, before they were crammed into ships bound for a life of slavery in the Americas. Its corridors are full of dungeons where only dim light coming from tiny windows let the light and air in. 200 males will be kept in space meant for 50 people or less, where they will spend over 23h a day for three months, and will only be brought briefly out to eat. Ironically, Christian services were held in the fort while these poor souls were screaming for their lives underneath.The majority of captives ranged between 15 and 35 years of age. Women were locked in 2 similar dungeons, 150 of them per chamber. They will be raped daily by the British soldiers, who would come into the cells and select the ones to spend the night with. Any slave who challenged the authorities was thrown into the condemned cell, which held 30 – 50 in a room no bigger than most walk-in closets. There, they would die deprived of food, water, light, and oxygen, clawing the brick walls and floors as they suffocated. To descend into the exposed brick castle feels like entering the depth of the underworld (I can only imagine how those captives felt going through there). There are five dungeon chambers for men. The strongest ones were separated during branding, when hot iron rods were used to mark their chests, and then chained and shackled together in the first chamber. The last cell has a hole in the wall, which leads into a deep dark tunnel which was used to take slaves underneath the castle’s courtyard, leading them to the “door of no return.” Cape Coast Castle was once the most active slave trading hub in West Africa. Slavery was not just a European affair, but an African one as well, since many African chiefs traded slaves (rarely their own people – but people from other nations) to the Europeans in exchange for goods. Thus, the Ghana House of Chiefs – a body comprising all the country’s traditional kings and chiefs- has placed a plaque on one of Cape Coast castle’s walls, asking for forgiveness to the souls of those who were sold. When will European nations also ask for forgiveness? Many of us would rather stop talking about what was done to our blood and instead focus on the future of our race. I say it’s utterly disrespectful to our ancestors, we must remember. We must always remember. I totally agree with you Akinyi, it is utterly disrespectful to our ancestors not to remember. Although it is very painful, we need to know about our past and all the hurts, so that we can be empowered for the future. Absolutely true. This bitter part of our parts must never be forgotten, unfortunately the clueless political “leaders” of today are totally unworthy of the generations that fought for our liberation from colonial rule, civil rights, and slavery. We must make unrelenting efforts to collate this bitter experience from Haiti to the Americas to South Africa. This is the history and consciousness we must teach in our schools and make sure our children understand the past and the effect on the present. This is true education for the modern African. This is the only way we would have the courage and understanding and forge the spirit of self-determination to stand on our feet and reject western neo-colonialism today. This is the African man’s pilgrimage otherwise we shame our ancestors. It is as if we make fun of their enormous suffering and pain and resistance. Totally agree with you Kwamena.